SOMERS POINT, N.J. (March 29, 2017) – The Every Breath Counts Foundation will present a donation to the South Jersey Cancer Fund on Monday, April 3. Mary Crane, President of the South Jersey Cancer Fund, will accept the donation from Barbara Douglas, President of the Every Breath Counts Foundation. 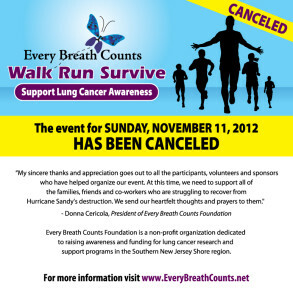 Every Breath Counts presents its annual Walk, Run, Survive 5K on the Boardwalk in Ventnor, NJ on Saturday, November 12, 2016. Registration begins at 8 a.m. at St. James Memorial Hall, Newport & Atlantic avenues. Runners will head to the Boardwalk at Newport Avenue at 9:55 a.m.; race begins at 10 a.m. Pre-registration is $25 for adults, $15 for children 12 and under, free for lung cancer survivors. All proceeds benefit the Every Breath Counts Foundation, which donates to three organizations focused on lung cancer: South Jersey Cancer Fund, LUNGevity Foundation and the Lung Cancer Alliance. Register, sponsor a runner or donate here. 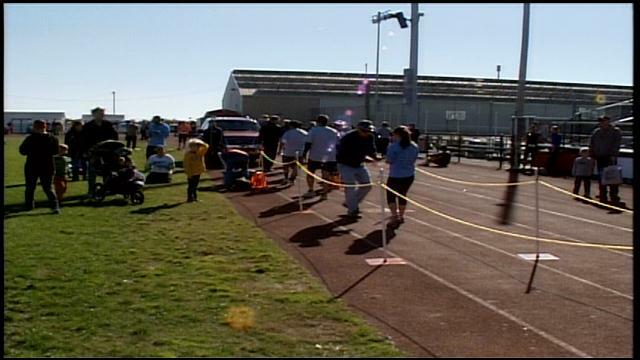 240,000 people will be diagnosed with lung cancer this year, and today, a local organization held a 5K to raise awareness. The Every Breath Counts Foundation hosted the event in Ocean City today. Statistics say that of the 240,000 diagnosed with lung cancer this year, 60,000 will die. 80 percent of those diagnosed are never or non –smoker, says Jamila Glapion. The Every Breath Counts Foundation says that their goal is to raise awareness and funding for lung cancer research and support programs around the area.